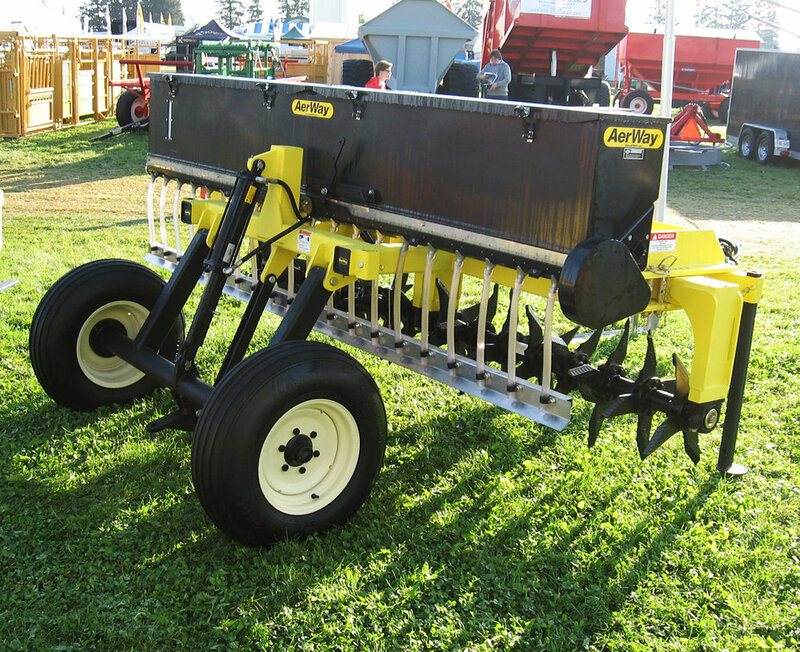 Are you interested in a quote or demonstration of the ATS Seeder? Please fill out the form below and one of our Territory Managers will be in touch shortly. The ATS (Aerway Topdress Seeder) features a dedicated 10-ft. quick-adjust frame with an integral full-width 10-bushel linear seed box. The seed box is driven by a 12-volt constant speed electric motor. The seeder will handle a wide variety of seeds as well as granular herbicides and insecticides. AerWay’s patented tines lift and shatter compacted soil. The quick adjust features allows you to easily vary the swing angle to achieve your desired seed bed. The seed box has a cam type meter for adjusting the opening for various seed types. The internal five blade rotor delivers the seed to the 20 drop tubes and bottom deflector plate. This ensures uniform seed distribution even on windy days. The optional finishing tool or harrow you’ve selected provides seed to soil contact. 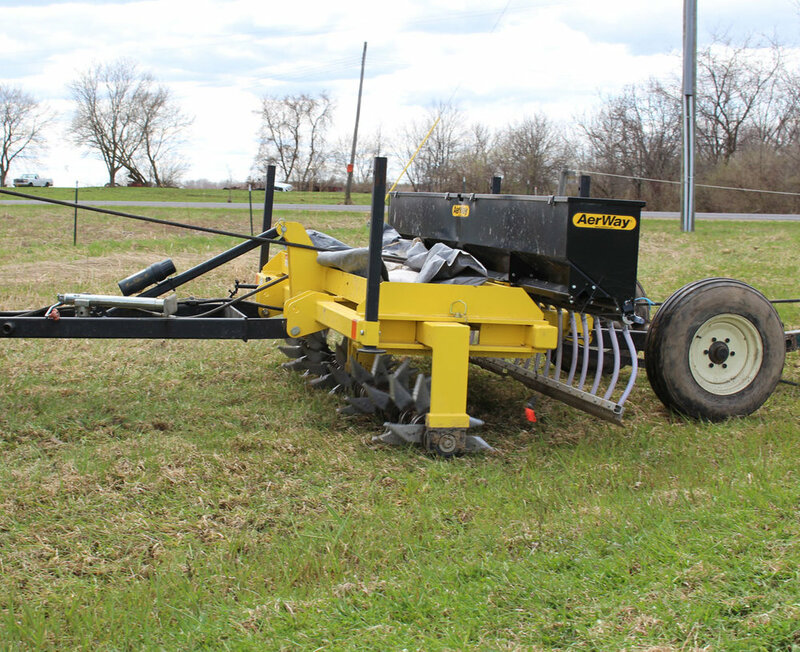 Because of its unique design when not being used as a seeder, the ATS is used in pastures to relieve compaction or renovate old pastures after each hay cutting. Aeration allows increased water infiltration and plant simulations for greater growth. Wheel and tire assemblies: 9.50 x 15 TL 8 ply mounted on 15 x 8 wheels. Two supplied. Tie rod cylinder 3” bore x 12” stroke supplied complete with mechanical lock out for parking the unit. Deflector plate spaces the drop tubes and spreads the seed in a uniform pattern. The winter trade show season is in full gear for Salford Group, and Canadian territory managers Glenn Herperger and Doug Achtymichuk, joined by Valmar’s Jason Janzen, are traveling to Brandon, Manitoba for the province’s annual Ag Days event. It’s very early in the New Year, and the Salford Group crew is already taking its efforts into high gear on the agriculture show circuit. Next week sees the team make key stops in the southeastern United States and Western Canada.